Many people believe when a person dies, his soul returns on the 7th night. After Shun was brutally murdered, his spirit returned to possess his 13 year old sister to exact his revenge. On the 7th night, blood will flow and just deserts will be served. It’s taken a while for this Chai Yee Wai film to make its way to home video (it was released in cinemas more than a year ago) but don’t let this slip by you if you haven’t already caught it theatrically. The first film to emerge under the Singapore Film Commission’s Feature Film Fund, “Blood Ties” is a gritty, often bloody and consistently entertaining horror thriller that establishes Chai Yee Wai as one of the most promising local young directors. Adopting a non-linear approach to unfold his story, Chai shuttles back and forth between two parallel plot threads. The first has veteran Hong Kong actor Kenneth Tsang playing slain police detective Shun (David Leong)’s partner Woon, visited seven nights after Shun’s death by his mother Mdm Lee (played also by a veteran, Cheng Pei Pei). Shun’s mother is frantic because her daughter and Shun’s younger sister, Qing (Joey Leung) has gone missing. The other part of the story sees Qing on a revenge mission, apparently possessed by the Shun’s spirit, as she goes around taking out the people responsible for his brutal death and that of his wife. From time to time, Chai brings his audience back to the scene of the crime, disclosing detail by detail of the heinous act- while the repetition does get a little tiring after a while, there is enough mystery and revelation at each turn to justify your attention. There is also a lot of blood spilled, and squeamish audiences may be turned off by the decidedly violent fashion that Chai has chosen to film the movie. Lacking the experience of a more seasoned director, Chai does let the violence get a little excessive at times- though the brutality does give reason for the comeuppance the ultimate baddie suffers at the end. This comes in the form of a twist, and even if it isn’t too surprising, Chai makes sure that the story he weaves doesn’t have obvious loopholes. Besides the copious amounts of blood, what makes Chai’s film stand out from the regular made-in-Singapore movie is the “Hong Kong feel” that he has injected. Shun’s death at the hands of the underworld rings smack of the triads we often see in Hong Kong movies. Ditto for the hint of corruption within the police force- even the police station that Shun’s mum visits is simply titled “Central Police Station”. While certain locations betray the Singapore setting of the film, Chai has clearly made a movie not just for local audiences, but one international audiences can enjoy- which is saying a lot for local movies nowadays. It is no wonder then that he has been able to attract veterans like Kenneth Tsang and Cheng Pei Pei to act in his film, both delivering strong performances lamentably absent from many local movies. Screen debutant Joey Leong however steals the show in a arresting performance alternating between wide-eyed anxiety and steely vengeance. Even the support cast also do well in their respective roles, and rarely is a local film this consistently well-acted. 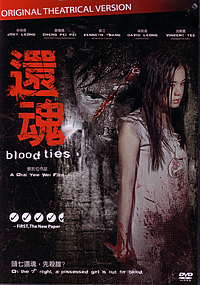 Indeed, “Blood Ties” is a great leap forward for the local film industry. For once, a local film has boldly gone beyond the low-brow Jack Neo and company type humour, opting instead for a horror thriller that is not afraid to be bloody when It has to in order to deliver a genre experience. It’s even more admirable that it is Chai’s first feature-length film, and firmly establishes him as a young director to watch for in future. The most significant extra here is the collection of interviews with the cast- Joey Leung, Cheng Pei Pei, David Leong, Kenneth Tsang and Jimmy Low- where they discuss their experience working on the film. The behind the scenes footage is interesting to watch for Chai’s steady directorial control. There are also two music videos (Music Box by Shirlene Tia and They Long to be Close to You by Joanna Dong) as well as the theatrical trailer. The audio is heavy on the front speakers but boasts enough of a surround effect during the film’s atmospheric moments. Visuals are clear and sharp without any visible flaws.